None of our pre-sheduled clinics fit YOUR schedule? You have a group or are a person wanting a private/semi-private clinic or guided adventure? You want a custom getaway in the beautiful Coastal Mountains of BC or Kootenay Mountains of BC? No problem! We can cater to any person or group at anytime! Please send us an email for availability! We have safe knowledgeable guides that will make sure you experience the most memorable snowmobile trip you have had to date. Read about our guides HERE. Sled & Stay in Nelson BC - special 2019 season offer! In conjunction with Frozen Pirate Snow Services we are proud to present to you the She Shreds VALEMOUNT clinic! 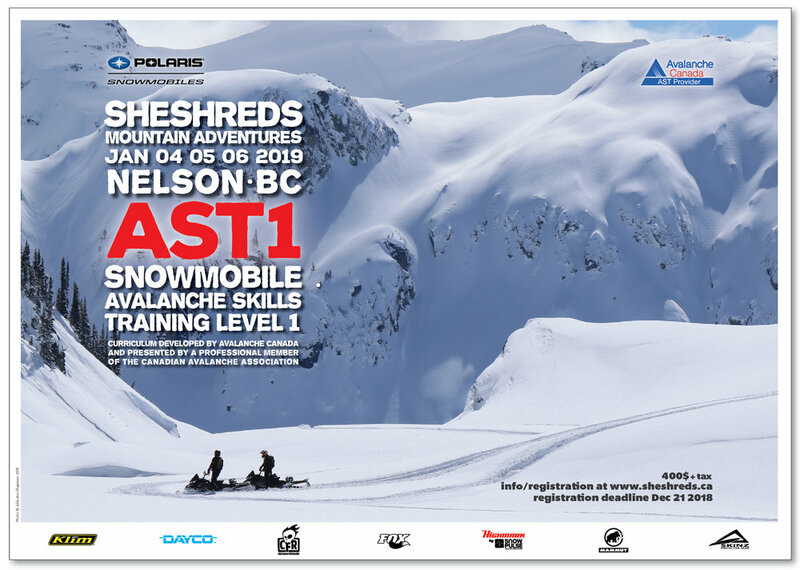 In conjunction with Great Canadian Snowmobile Tours we are proud to present to you the She Shreds REVELSTOKE clinics! COST: $975 + TAX. SIGN UP DEADLINE Mar 8 2019. This clinic is designed to help the intermediate or advanced rider move to the next step of freeriding in the backcountry. It is open for women only. Its all about starting small with something you are comfortable with and moving to something bigger when you are ready. Lots of photos and videos will be taken of you to show your loved ones all their air miles you collect all weekend! There is nothing better of a feeling when you're out in the backcountry getting cheered on by a bunch of ladies to hit something! MARCH 2 2019 - BEGINNER LADIES - You're first time on a sled? Maybe second? You're thinking of maybe getting into the sport and want to give it a try! This is the clinic for you! MARCH 3 2019 - INTERMEDIATE LADIES - You're still borrowing your man's sled or getting doubled lots? You just bought yourself your first sled? You barely know the basics but are really starting to grow a passion for sledding, this is the clinic for you! Tips to help you progress your skills on your snowmobile - lots of riding! Must have your own snowmobile and must be somewhat comfortable operating it. Lodging or sled is not included but can be booked at an extra fee if needed. Open for men and women. The Avalanche Skills Training Level 1 Course will provide a beginner level decision-making framework that is based on the most advanced knowledge available. It is suitable for use by people with a little to no degree of training and experience. A perfect weekend Valentines getaway filled with what we love most - snowmobiling!! oh and our loved one! This clinic is open for all ability levels. There will be 2 coaches/guides therefore we can split off if need be (split off by ability level or split off men/women groups), but its Valentines so why not sled with our loved ones! 2 full days on snow, avalanche safety seminar, and much more! Tips to help you progress your skills on your snowmobile off trails - lots of riding! January 12 2019 FOR BEGINNER RIDERS LADIES ONLY 1 DAY CLINIC - You're first time on a sled? Maybe second? You're thinking of maybe getting into the sport and want to give it a try! This is the clinic for you! January 13 2019 FOR INTERMEDIATE RIDERS LADIES ONLY 1 DAY CLINIC - You're still borrowing your man's sled or getting doubled lots? You just bought yourself your first sled? You can kind of counter steer in deeper snow, but want to perfect it. You wouldn’t mind an introduction to sidehilling? You barely know the basics but are really starting to grow a passion for sledding, this is the clinic for you! She Shreds @ Edmonton Snowmobile Show! Julie-Ann Chapman & She Shreds Mountain Adventures will be in the KLIM booth at the Edmonton Snowmobile Show! Stop by and say hi and ask her any questions you might have on this seasons clinics or guided adventures! Register for any She Shreds clinic or guided adventure AT the show and recieve 10% discount!! *Not valid for avalanche courses, Quebec clinic, Valentines or Jumps & Drops clinic.